Tag Archives for " Dark Posts "
As with all things in this fast changing digital world, a killer tactic today may soon be worth very little when, for example, the network you’re using it on decides to change the rules or it simply becomes diluted due to the fact that everyone is doing it now. For today one of the most effective advertising plays on Facebook is something being called ”dark posts.” The term, while sounding a tad evil, actually applies to the tactic of using news feed style ads that do not actually get published to the newsfeed of your page. So, you might ask – why would I use this tactic? Imagine you sell four products and these products appeal to slightly different audiences and you’re not really sure of the most appealing call to action for each. Traditionally, the only way to advertise those four products in the news stream was to create four status update kinds of ads and then refine your targeting to get the add seen by the right audience. But here’s the catch – all four of those ads just ran in your page’s stream and now that audience you’ve worked long and hard to build by sharing useful and engaging stuff is unliking as fast as they can. Your stream seems full of nothing but ads! Oh, and like any smart marketer you need to A/B test several headline variations on each ad, further overwhelming your stream. Facebook has allowed advertisers to create news stream ads with the option of not publishing to them to the news feed for some time, but it’s still a fairly untapped play for the moment. By employing this tactic the advertiser mentioned about could run all four product ads as sponsored posts, target different audiences, split test headlines and even create personalized messages for demographic and geographic targets – literally run dozens of ads all on the same day – without a single ad showing in their own news stream. Are you starting to sense the power of the dark post? 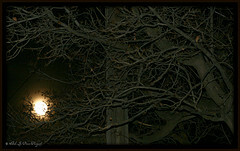 Dark posts are created using the somewhat clunky, very obtuse, Power Editor. I won’t go into a tutorial on obtaining and using the Power Editor as there are some fine ones here. If you have no idea what the Power Editor is you should read one of these tutorials before going much further. If you are a Power Editor user you simply need to play around with a few more features. The key to creating dark posts in the Power Editor lies in the editor’s ability to create posts. Until the dark post concept came along there really wasn’t much reason to use this feature as you could simply create posts as status updates. Fire up the Power Editor and start by clicking on Manage Pages and choose the page you would like to create the post for. 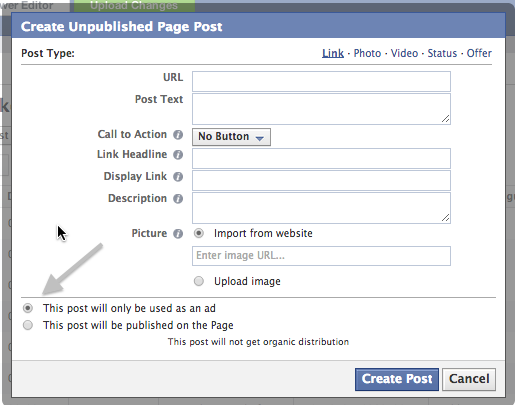 Now hit Create Post but be sure to click the radio button that says – unpublished post. Now create your post by completing the fields. Remember, this is an ad, so pay close attention to headlines, call to action buttons, descriptions and images that grab. For some of the best advice on successful Facebook ad tactics head over to Jon Loomer’s awesome site. Once you’ve created your post don’t forget the Power Editor requirement to upload the changes – the button at the top of the editor turns green when you’ve made a change and you have to hit that Upload Your Changes button before you can use this post. Once all of your posts are created and uploaded you can switch to your Ad Manager and start creating ads by selecting the appropriate post to use as an ad, select your audience and choose your budget. One bit of advice, don’t take the Facebook suggested budget. My experience is that you can start much lower and adjust accordingly. I don’t have hard data on this, but since I started refining better for multiple versions, I found my per click costs went down. You can organize your ads by campaigns and ad groups, a feature that certainly makes sense when you start running lots of ads for different things. Once your ads are approved you can start monitoring your Ad performance to tweak your tests and improve your results. Now is the time to get on this tactic as my guess is that sometime in 2015 it will become less effective.